Ready to Revitalize Your Body and Your Life? Regardless of whether you are a world-class athlete, or an average person looking to lose weight, regain energy, or overcome a chronic health condition, we can help! I’m Samantha Yates-Karam, founder of Karam Institute, and our Black Bull Protein brand of whey-based protein products. I’m committed to getting you on a winning path to your healthiest self. Trained in both Western and Eastern modalities of medicine, with a background as an executive chef, I believe that our bodies can heal themselves given the right nutrition. My clients, ranging from kids, parents, and older adults to professional body builders and weight lifters, have achieved amazing results. Goat Whey Protein Smoothies are ideal as a meal replacement shakes or snack. 100% Lactose free and a great source of protein. Gets you through the day! Whether you are looking for meal replacement shakes, protein shakes, trying to lose weight, increase lean muscle, or are recovering from a muscle injury, adding a little extra protein to your diet is very important. Adding extra protein is equally important for those who are going through significant growth changes such as growing children, teenagers and even pregnant women. There are many different ways to add this extra protein to your diet, and many people find that whey protein is very convenient, effective and easy to use. When we think of whey protein we usually think of whey protein made from the milk of cows. However, whey protein can be made from goat’s milk as well. 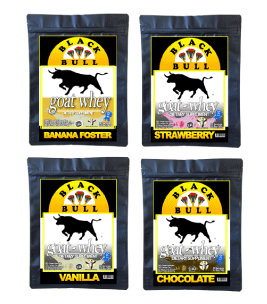 It may sound like an old fashioned remedy, but BLACK BULL goat whey protein is a natural dietary supplement that is very effective for muscle growth and muscle recovery. “I have been a motivational speaker for over 30 years and believe in a healthy diet and workout regimen to keep me going. I needed protein powder for my workout and to get me through the day, but didn’t like the chalky taste of protein shakes. As I am getting older, I found that my body was rejecting and allergic dairy from a cow. Then my fiends told me about Black Bull Protein which is 100% goat Whey. I ordered a bag and have been taking it now for 6 months. I feel fabulous, lost of energy, and a hundred percent better with no side allergic effects. “After using Black Bull Protein (chocolate is my favorite), I have lost about 88 pounds over 2 years.